Here's one I'd been wanting to discuss for quite a while. 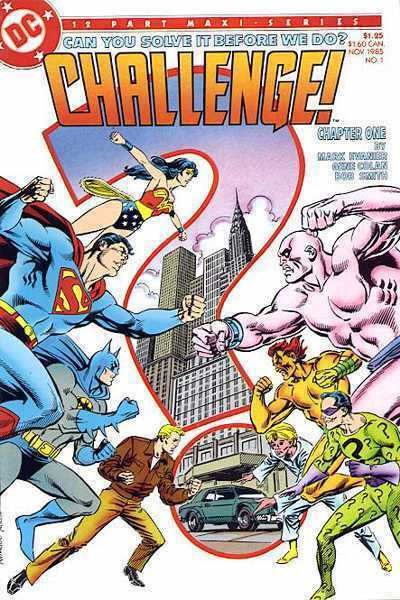 The DC Challenge was something of a "traveling story" or "round robin" wherein a different creative team would work on each issue of the twelve-part maxi-series. Each writer would challenge the next by putting the heroes in a kind of impossible situation (though one that can be solved). It would be up to the following writer(s) to figure out how to pull them through, just to put them into another sticky-wicket before handing it off to next. One issue writer would also sorta-kinda handcuff the next by actually naming the subsequent chapter. The main rule of this endeavor was that the creators couldn't cheat, by claiming what happened in a prior chapter was a dream, or an illusion, or a hallucination. They actually had to logically (insofar as comics logic, I suppose) come through with a solution that fits the narrative and moves the story forward. Fans were also encouraged to make their own guesses at how the story was going to pan out the the point that the tag-line of the event was "Can You Solve it Before We Do?" The timing of this piece is also actually relevant, as DC Comics is moving into Rebirth-mode, and making all sorts of exciting new announcements... including a spiritual successor to the DC Challenge in the Kamandi Challenge. There's really no better (or apropos) time to dive into challenge mode here. Our story begins with young copy boy, Floyd Perkins wandering the halls of the Daily Planet building. He's been around for a spell, however, feels helplessly lost. He exits an elevator that deposits him on a floor he'd never known before. He wanders further until he finally hears some voices coming from an office with a cracked door. With all the grace of an elephant on a lily pad, he stumbles into the room. Inside he finds a weird group of people including an incredibly strange pointy-eared fellow who tells him he'd best beat a hasty retreat. As he bolts to the elevator he appears to run into Humphrey Bogart who nonchalantly asks if he's got "a light" for his cigarette. On the streets of Metropolis Superman is embroiled in combat with a demon that had been released from the body of a fallen man. As they fight, Jimmy Olsen looks on... alongside Groucho Marx. Superman is on the ropes as the demon takes the upper hand in their struggle. Superman suddenly hears a disembodied voice that pleads with him to somehow lower the air pressure around the demon. Superman takes the advice, and begins flying around the demon in tight circles until it retreats back into the fallen man's body. Superman picks up the man, and flies him to Gotham City... which is apparently world-famous for the quality of their iron lungs. The Gotham doctor tells Superman that the fella is named James Hoyt. Rather than go to the Metropolis Police Department, Clark Kent pays Commissioner Gordon a visit to see if he knows what's what. The Commish regretfully informs Kent that Mr. Hoyt was a small-time crook who has been dead for a couple decades. "He was dead... the whole time!!!" They pop the tape in, and find that the Riddler is the star of this film. He comes right out and says that he knows Bruce Wayne is Batman (ruh roh), and gives him a riddle about (K)nights that leads him to the... Gotham Museum of Knighthood. Inside Batman observes a petty crook trying to make off with a strange stone tablet. Batman ain't gonna let that fly, and the two tangle for a bit. Batman interrogates the man for information on the Riddler's whereabouts, however, the crook says he's working for Adam Strange. Surprised, Batman turns around and finds yet another riddle. Superman heads up to the Justice League Satellite to do some research on the JLA Computer in regard to the demon he'd fought. He is surprised to find that the Satellite is empty, and comments that it was Aquaman's "turn of duty". After randomly and repeatedly mashing down keys, Superman discovers some connection between the demon and the Moon... and off he goes. On the Moon, Superman discovers an odd machine (or maybe it's a robot... I dunno) that appears to be powered by red sunlight. He is approached from behind by a familiar (though, unseen to the reader) foe, and is zapped with a red beam that puts him out of commission. Back on Earth, Jimmy Olsen and Floyd the copy-boy are comparing stories about the weird things they'd just seen. They decide to tour the building to find the strange floor from the story's open without any success. Back in the Daily Planet offices, the boys find Perry White arguing with a blonde man who is desperately seeking Superman. He is Adam Strange... and Perry couldn't care less. He kicks ol' Adam out like he would any other bum. In Washington DC, Steve Trevor and Diana Prince are being briefed on a stolen nuclear device that is no larger than a paperback book. The pair head out, and Diana promises to "contact" Wonder Woman. I'm not sure if Trevor was privy to Wondy's secret ID at this point (or ever, if I'm being honest)... but we'll just go with it. Wonder Woman meets with the creator of the nuclear device when he suddenly collapses and releases a demon of his own. The two engage in battle, and Wonder Woman gets completely wrecked. As the beast flees, Wonder Woman gives chase in her robot plane, which by the looks of it is driven kind of like a car on the Flintstones. Did her feet always dangle from the invisible jet? Back in Gotham City, at Arkha... Gotham Penitentiary, Batman is looking for information on the Riddler. He is advised that the Riddler never escaped, and he's still in his cell. Lucky for Batman, as he is apparently stumped by the latest riddle... Wait, really? Okay... well, he tells the riddle to the Riddler, who gives him the answer... sending Batman to the Gotham City Power Plant. I think I wrote "riddle" in this paragraph 45 times (46 now). At the Plant, Batman runs afoul of the same pointy-eared oddball from the Daily Planet's phantom floor. He's wearing a turban now, but I'm pretty sure it's him. Batman chases the creep down, and is shown a list of numbers that had been scrawled on a nearby wall. Batman asks what it all means, but the weirdo refuses to answer... it won't matter anyway, as they're all gonna die in a nuclear blast! The issue closed with a two-page text piece about the DC Challenge concept. Well, I guess that was a thing. Overall, I did not find myself enjoying this nearly as much as I thought/hoped I would. The entire endeavor seems to be far more entertaining to the creators than to the readers. I'm not really a fan of other peoples inside jokes, and I kind of felt like I was reading an interoffice memorandum with some winks and nudges. I can see why and how this would be an interesting concept to pursue, and perhaps (hopefully) it gets better as it moves along. I do have a few more issues of this kicking around the library so maybe we'll find out. The writing was okay. I think being the first chapter of this experimental title may have perhaps facilitated all of the wackiness and randomness this issue featured. I am somewhat interested in how they'll work their way out of Batman's secret ID being out there... Although, I'm really not sure if this event is anywhere near the contemporary-at-the-time continuity. Gene Colan's art was what could be expected. It was very nice and in my opinion, the bright spot in this issue. Really not a whole lot to say here. It feels almost unfair to judge it by merits of its story... because, I'm not even sure that's what they were going for. Like I said, this almost feels like it's more for the DC Staffers than DC Readers... this is a writers-workshop exercise. Those are always fun to take part in, however, if you're not involved with the creative process (or don't have any stake in those that are) it's just not that compelling a read. I'm cautiously optimistic that the upcoming Kamandi Challenge will be better, and that reader interest/engagement/entertainment is at the paramount rather than how much fun the creators are having nudging and prodding one another. With the ubiquitous nature of social media, we will now have a front row seat to the creators discussing how they're going to "stick it to" the next guy or gal on the list... I'm just not sure how much fun for those "outside the loop" this is all going to be. Look like the social outcast you are! Shushfur = Chauffer... I've been saying it wrong my entire life! Extra points for using "sticky-wicket!" And yeah, that was my feeling about this series way back when, that it was rife with in-jokes. Normally I love figuring stuff like that out, but this series was more obtuse than the first De La Soul album. The weird thing about this one is that I cannot figure out how a reader could possibly come up with a solution, when each and every issue would throw another wrench in the works... Too full of winks and nudges to the next guy on the assembly line to be fully enjoyable. It looks like the comic book version of Jenga. Trying to see if you could position enough pieces to where the next writer toppled the tower of disbelief. Pretty much on the money there. It was writing the next guy into a corner... the kind of things that we'd do as a project in a writing class/club. Fun for the participants, but not so much for the outsider. I was in on this for about five or six issues, and then I dropped it...and this was when I was a kid, and never dropped ANYTHING. I often wonder how it would hold up now, but I guess you answered that question for me. It's funny, when I rediscovered this one in my bins I had a brief thought about buying up the few issues of the series I'm missing and working my way through it here on the blog. After reading the first one... ehhhh, that's probably not gonna happen... that is to say, I'd have definitely dropped it organically after a few issues too.